The Qt WebEngine module provides a web browser engine that makes it easy to embed content from the World Wide Web into your Qt application on platforms that do not have a native web engine. A web engine view is the main widget component of the Qt WebEngine module. It can be used in various applications to load web content. Within a view, a web engine page holds a main frame that is responsible for web content, the history of navigated links, and actions. The view and page are quite similar, as they provide a set of common functions. All pages belong to a web engine profile that contains shared settings, scripts, and cookies. Profiles can be used to isolate pages from each other. A typical use case is a dedicated profile for a private browsing mode, where no information is permanently saved. Note: The Qt WebEngine Widgets module uses the Qt Quick scene graph to compose the elements of a web page into one view. This means that the UI process requires OpenGL ES 2.0 or OpenGL 2.0 for its rendering. The Qt WebEngine QML implementation contains the same elements as the Qt WebEngine Widgets implementation, except that there is no separately accessible web engine page. The supported page functionality is integrated into the web engine view. The Qt WebEngine core is based on the Chromium Project. Chromium provides its own network and painting engines and is developed tightly together with its dependent modules. Note: Qt WebEngine is based on Chromium, but does not contain or use any services or add-ons that might be part of the Chrome browser that is built and delivered by Google. You can find more detailed information about the differences between Chromium and Chrome in this overview that is part of the documentation in the Chromium Project upstream source tree. This version of Qt WebEngine is based on Chromium version 56.0.2924.122, with additional security fixes from newer versions. Use the QWebEngineView class to display web pages in the simplest way. Because it is a widget, you can embed QWebEngineView into your forms and use its convenience functions to download and display web sites. Each QWebEnginePage belongs to a QWebEngineProfile that can have a QWebEngineSettings for specifying page settings, a QWebEngineScriptCollection for running scripts on the page, and a QWebEngineCookieStore for accessing the HTTP cookies of Chromium. A QWebEnginePage can also directly point to a script collection. 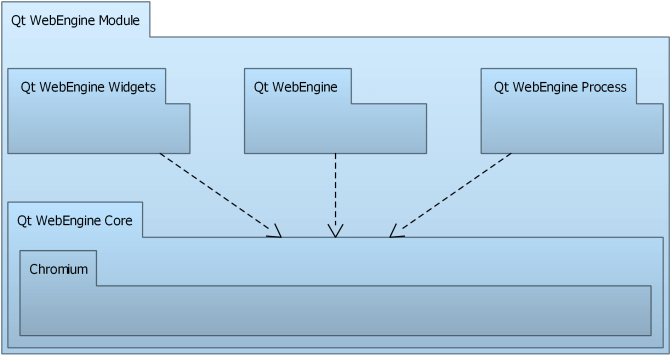 The WebEngineView QML type allows Qt Quick applications to render regions of dynamic web content. A WebEngineView type may share the screen with other QML types or encompass the full screen as specified within the Qt Quick application. An application can load pages into the WebEngineView, using either an URL or HTML string, and navigate within session history. By default, links to different pages load within the same WebEngineView object, but web sites may request them to be opened as a new tab, window, or dialog. Qt WebEngine does not allow direct access to the document object model (DOM) of a page. However, the DOM can be inspected and adapted by injecting scripts. The DOM of a page is constructed when the document is ready, typically when the page is completely loaded. Therefore, executing scripts as soon as a document is created is not suitable for DOM operations, where one has to wait until the DOM is ready. In addition, an injected script shares the same world as the other scripts executed on the page, which might lead to conflicts. To avoid this, the QWebEngineScript class and the WebEngineScript QML type provide implementations of the Chromium API for Content Script Extensions. They specify the script to run, the injection point, and the world where the script is run. This enables accessing the DOM to manipulate it within a world. Qt WebEngine uses its own network stack, and therefore QSslConfiguration is not used to open SSL connections. Instead, Qt WebEngine uses the root CA certificates from the operating system to validate the peer's certificate. The WebEngineCertificateError::error and QWebEngineCertificateError::Error enumerations provide information about the types of certificate errors that might occur. The errors can be handled by using the WebEngineView::certificateError QML method or by reimplementing the QWebEnginePage::certificateError function. Qt WebEngine uses the proxy settings from Qt Network, and forwards them to Chromium's networking stack. If QNetworkProxy::applicationProxy is set, it will also be used for Qt WebEngine. If QNetworkProxyFactory::usesSystemConfiguration() is enabled, the proxy settings are automatically retrieved from the system. Settings from an installed QNetworkProxyFactory will be ignored, though. Not all properties of QNetworkProxy are supported by Qt WebEngine. That is, QNetworkProxy::type(), QNetworkProxy::hostName() and QNetworkProxy::port() are taken into account. All other proxy settings such as QNetworkProxy::rawHeader(), QNetworkProxy::user(), or QNetworkProxy::password() are ignored. If a proxy requires authentication, QWebEnginePage::proxyAuthenticationRequired is emitted. For Qt Quick, a dialog is shown. To support High DPI devices, it is recommended that the application attribute Qt::AA_EnableHighDpiScaling is set to enable automatic scaling based on the pixel density of the monitor. In Qt WebEngine applications, the scaling affects the default zooming factor and scrollbar size. Qt WebEngine bundles images for normal and high-dpi resolutions into qtwebengine_resources_100p.pak and qtwebengine_resources_200p.pak files. Depending on the target resolutions, one or both of these files need to be deployed. For more information, see High DPI Displays. Qt WebEngine Core provides an API shared by Qt WebEngine and Qt WebEngine Widgets for handling URL requests issued for the networking stack of Chromium and for accessing its HTTP cookies. Implementing the QWebEngineUrlRequestInterceptor interface and installing the interceptor on a profile enables intercepting, blocking, and modifying URL requests (QWebEngineUrlRequestInfo) before they reach the networking stack of Chromium. A QWebEngineUrlSchemeHandler can be registered for a profile to add support for custom URL schemes. Requests for the scheme are then issued to QWebEngineUrlSchemeHandler::requestStarted() as QWebEngineUrlRequestJob objects. The QWebEngineCookieStore class provides functions for accessing HTTP cookies of Chromium. The functions can be used to synchronize cookies with QNetworkAccessManager, as well as to set, delete, and intercept cookies during navigation. Qt WebEngine currently supports only Windows, Linux, and macOS. Due to Chromium build requirements it also often requires a newer compiler than the rest of Qt. See Qt WebEngine Platform Notes for further details. Qt WebEngine supersedes the Qt WebKit module, which is based on the WebKit project, but has not been actively synchronized with the upstream WebKit code since Qt 5.2 and has been deprecated in Qt 5.5. For tips on how to change a Qt WebKit widgets application to use Qt WebEngine widgets, see Porting from Qt WebKit to Qt WebEngine. The Qt WebView module allows to use a native web browser on platforms where one is available.